We are dedicatedly engaged in offering ultimate solutions for High Mast Lighting Project. Owing to our domain expertise in the field of High Mast Lighting Installation, we have successfully executed many high profile projects in different parts of Uttar Pradesh. Our experts do a detailed survey of the site to analyze various aspects so that an efficient and viable solution etched out for erecting high mast lighting. 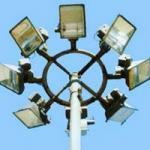 In addition, to this we are recognized as one of the major sources offering Lighting Solution Services in UP India.